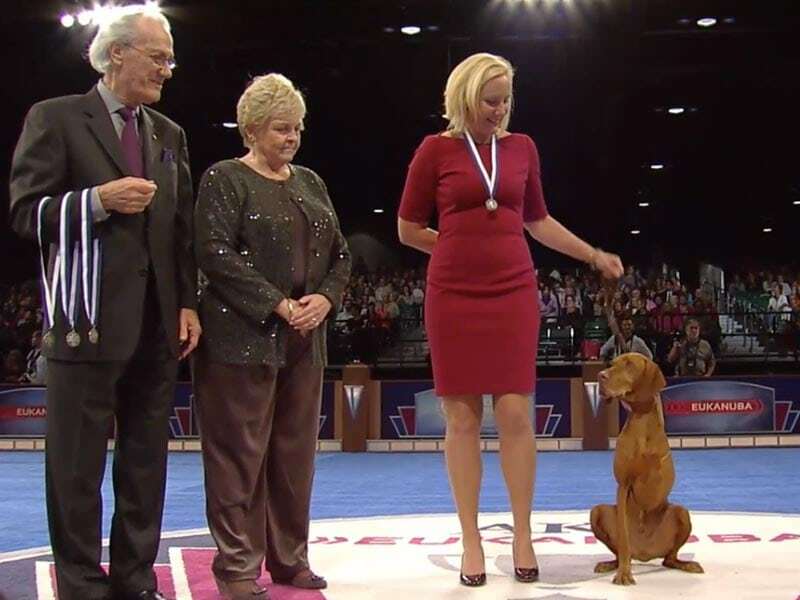 Last Saturday a first-of-its-kind Tripawd victory was witnessed around the world when The American Kennel Club presented its most prestigious honor to Bart, a three-legged Vizsla and five year osteosarcoma bone cancer survivor from Georgia. 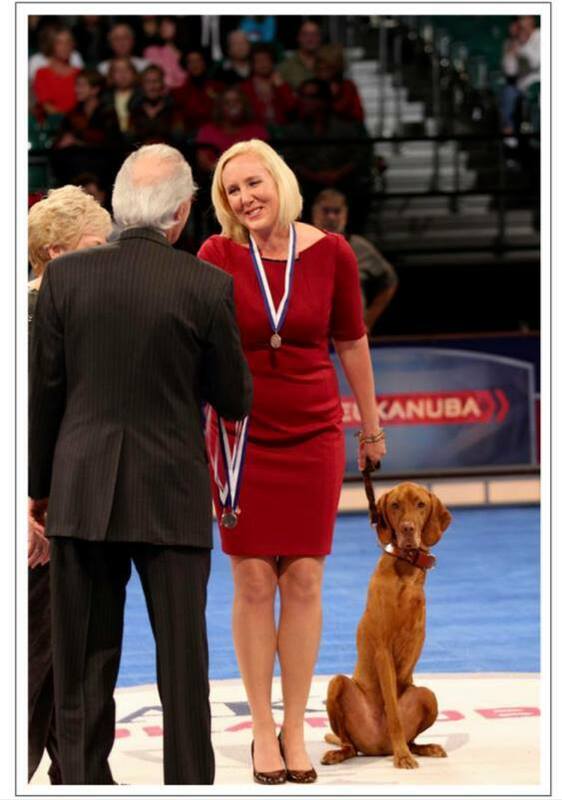 Bart and his mom Darcy were bestowed the AKC Humane Fund Award for Canine Excellence (ACE) at the AKC’s Eukanuba National Championship in Orlando, Florida. As you can see in this awards ceremony video, Bart shined like the superstar he is and Darcy was magnificent as she beamed with pride. What an honor it was when she asked us to create an original leather dog collar just for Bart to wear at this event! The three-day event drew thousands of enthusiastic dog lovers from around the world, several hundred of which visited the Vizsla Club of America’s booth where Bart reigned supreme. Darcy and Bart experienced three amazing days they’ll never forget. “When we would ride in the shuttles, Bart would climb in and just get in a seat like he was a person…everyone would laugh and take pictures, including almost all of the shuttle drivers! There was not a moment that was not amazing,” she said. From the moment he was diagnosed with osteosarcoma in 2008, Bart and his mom Darcy have shown the world that cancer and the loss of a limb need not stop anyone from living life to the fullest. This dynamic duo has been a part of the Tripawds community ever since his the earliest days of his cancer battle. 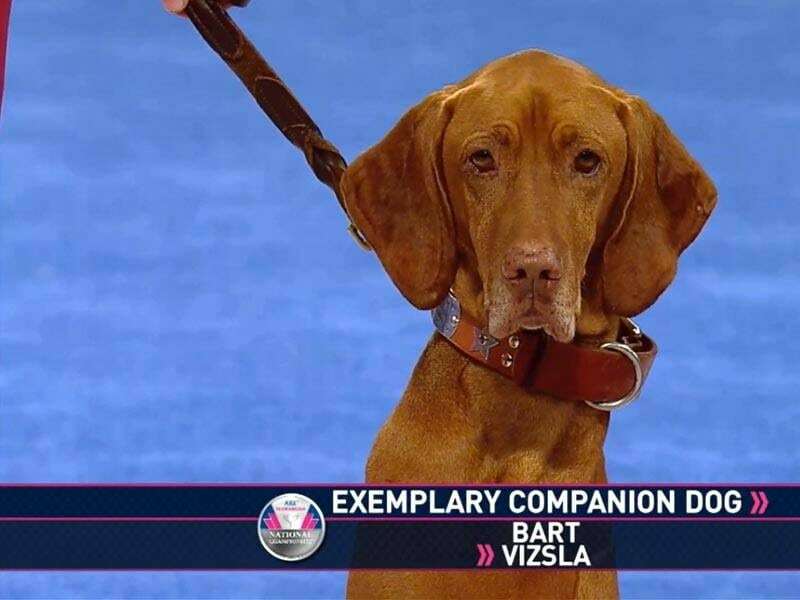 Since then Bart has achieved awards and accolades that no other Tripawd has ever received; from being the first three-legged Vizsla to earn an AKC Master Hunter Title, to his inspawrational cancer survival story, this handsome hero is the ultimate example of how to Be More Dog. While Darcy is extremely conscientious about making sure his activity level is appropriate for a Tripawd’s capabilities, she also understands that Bart was born to live his greatest passions and nothing has gotten in the way of his life’s work. At eight years old, he is officially retired from hunting competitions but we have a strong feeling that the best is yet to come for this one-of-a-kind Tripawd hero. Please give a 3-paw salute to Bart, winner, hero and inspawration. Congratulations Bart and Darcy! Learn about three-legged hunting champion Vizsla, osteosarcoma survivor and AKC Award Recipient Bart in article by Pam Stuart. 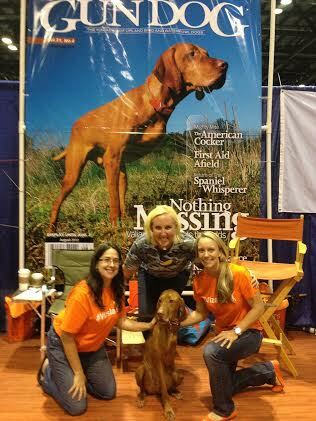 Download Tripawd Talk Radio interview with the mom and vet of a Bart, a three year canine cancer survivor and three-legged AKC hunting champion Vizsla. Wow, absolutely amazing! Bart, you are one special guy! Congratulations to all, the awards were well deserved for each pup. Bart, keep amazing the world!! How wonderful and what an honor! I just had to look at that video ne more time…..I guess I needed to cry some more!! I love how Bart was just being Bart…taking a scratchmat that magnificent collar…wagging his tail…just being Bart! And you were showering him with rubs and smiles the whole time…Darcy just being a loving partner! Love this video!! And the magazine cover…OMD! Tears are flowingover here….No…Wait! Not just flowing, I’m sobbing like a baby!! It is sich an honor, a true hoor, to be part of Bart’s extended tripawd family! Thank you sooooooo much for continuing to let us share in his incredible journey! The lives you and Bart touch…OMD!! I cannot even imagine! The number of people whose lives jave been changed because of this dog………WOW! A Goodwill Ambassador for hope! Bart is truy living a life of meaning! His life IS making a differece! The both off you are living in sync with your soul’s purpose! The twomof you were meant to be together n this journey…a destiny…..that’s all I can say, a destiny! You two had each other’s names written on your hearts the day you were born! I bow down in awe and reach through cyberland with love to you both. Sooooo proud to share in Bart’s Tripawd Nation! Way to go!!! Bart, we’re so so so proud of you and happy for you and your mom. A deserved award, indeed! Thanks for the incredible collar! We love it and received numerous compliments on how handsome it looked on Bart! My husband wants to put it in a glass case for show! I, however, enjoy looking at it around Bart’s neck which is where it will stay for a long while. So glad to represent Tripawds and to show the world that cancer and amputation does not have to reduce your quality of life! I am one proud mama!! 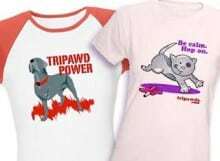 Love to the Tripawds Nation! !